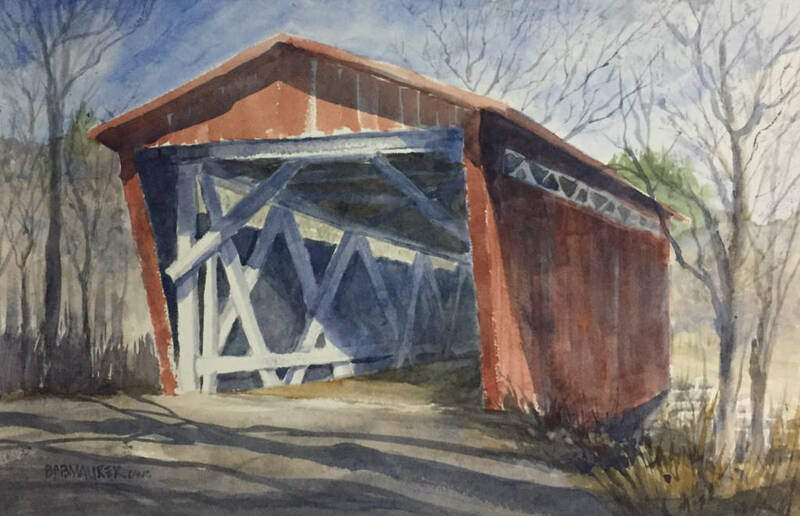 “Everett Road Bridge” by Bob Mauer. “The Best of the Ohio Plein Air Society II” is on view at the Group Ten Gallery in Kent. Plein Air painting, which is simply the act of painting outdoors, is an artistic practice that goes back centuries. Pushing beyond the traditional walls of a studio, artists take their chosen media and travel out into the community or countryside and paint what they see. The result can take the shape of a landscape or cityscape, but also can be a vignette or moment of life captured and expressed through what the artist is confronting. The challenge is that this practice is all done out in the elements, and weather and time often conspire to put limits on what the artist is trying to investigate or convey. Artists who often work in this way almost universally have stories of being caught in some type of weather; they also often have stories of having to deal with curious onlookers who want to watch, talk about how they love painting and/or relate a story about their own experiences. There is an exuberance and passion conveyed through this type of painting that is palpable when you look at the work, regardless of whether the artist has been particularly successful. The act of trying to get all the information on paper or canvas before the weather changes or the medium gets too dry comes through in the visual energy and makes the works interesting and enjoyable.